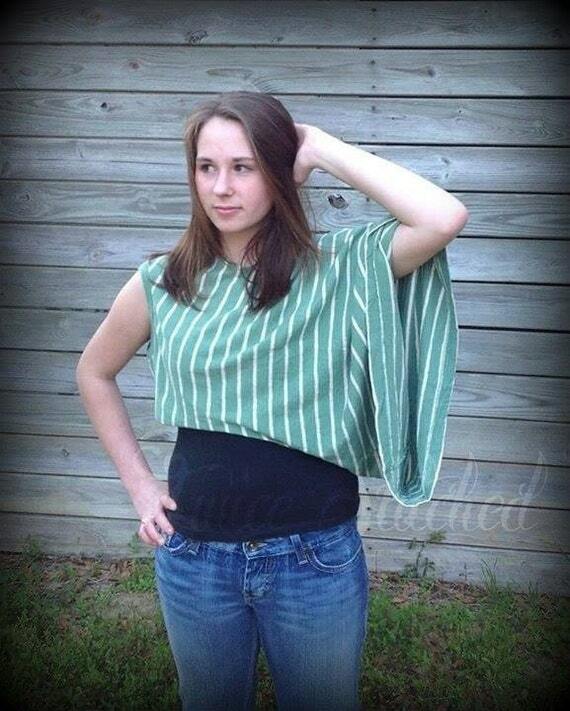 Refashioned upcycled fashion – so cute! I found it at Twice Stitched on Etsy – and Vanessa, the designer/artist/shop owner has some of the most fun, original, interesting, adorable clothes! It’s just a (big) plus that they are also eco-friendly and upcycled. And did I mention? Major affordable! You need to go shop there. You’ll thank me. The environment will thank you. And you’ll look so good! 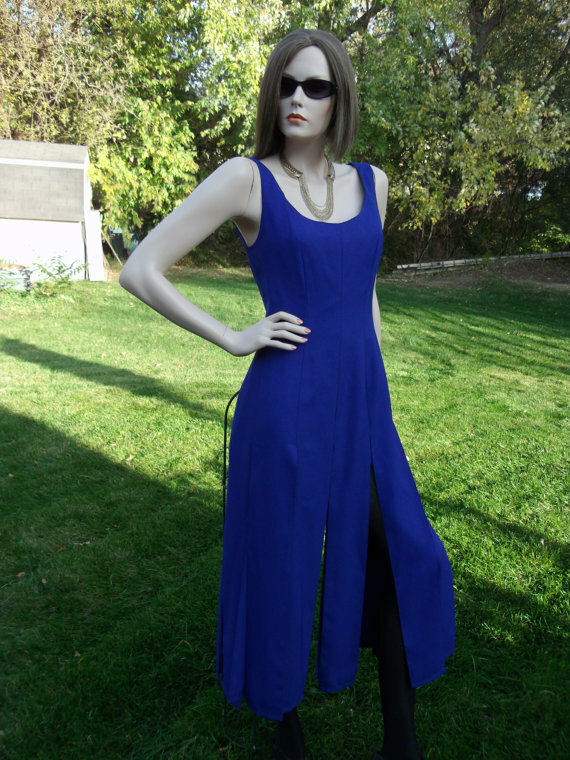 Upcycled dress. The best kind of fashion! 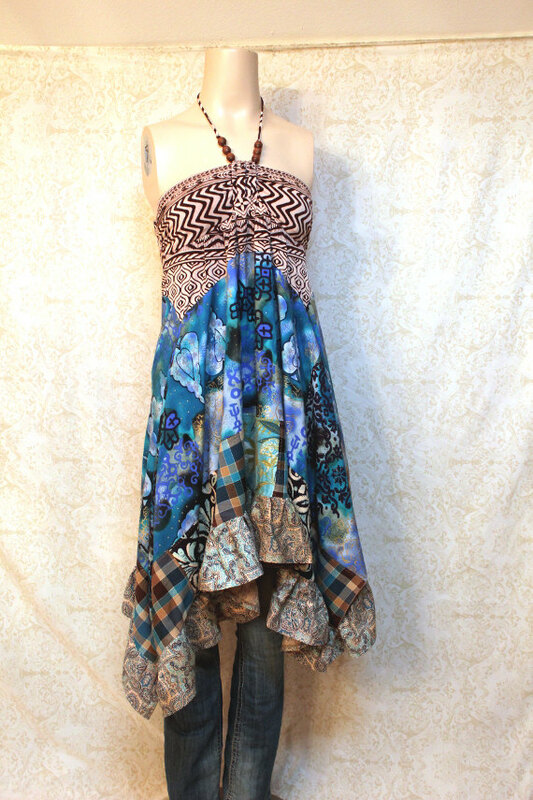 I saw this adorable dress on Etsy and loved the casual style. Then I noticed it’s made from upcycled components, and appreciate it even more. This is so smart! So: kinder to the planet. Ecologically smart. Original stylish dress. 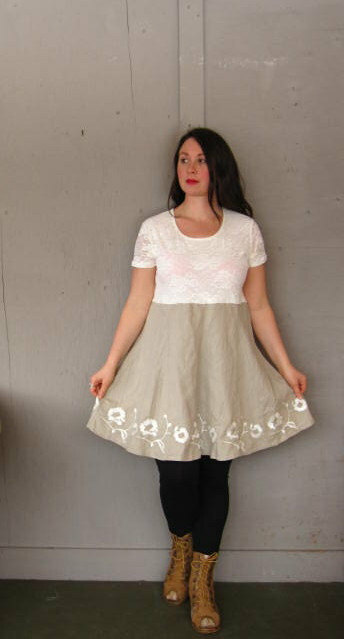 One-of-a-kind, well-made, affordable garments you’re going to love. This is what I call a win. Go shopping – you’ll thank me! So why do I say “the best kind”? 2. It’s upcycled, which is always of the good. 3. It’s year round wearable – how fun and flattering in the springtime, just like she’s wearing it in the pic? And for fall and winter, add leggings. Maybe a cami underneath, for body-hugging warmth. 5. And did I mention, it’s cute? Because it’s got to look great or you’re not going to wear it. But it does. So – like I said, the best! PS It’s available at Lillie Nora Dry Goods on Etsy, one of my favorite Etsy shops – where Barb, the artist / designer, has many adorable upcycled garments. This girl is *good*! I absolutely had to share this top with you. It is a great-looking, unusual, fun, crazy piece of clothing. Just imagine how much FUN it would be to wear this top? It’s made from vintage fabric and recycled tee shirts, so you know it’s comfy and feels good. I mean – fabulous and unusual. Affordable. And upcycled! This is just what I want to find when I go shopping. I found it at Primitive Fringe at Etsy. Deanna, the artist and owner, has truly done some scrumptious work there. 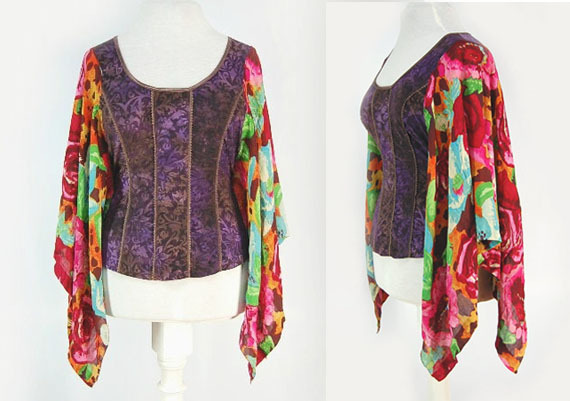 And – after I found this shirt, and more yummy upcycled clothing, I discovered that she has also done colorful, terrific jewelry too. This place is such a find! This is a great example of art that is also functional – and since it’s also upcycled, it’s like the best of both (all) worlds. Is that not great? It’s fabulous looking – interesting, funky, and modern. And hey, you don’t have to lose your keys anymore! And best of all, it’s upcycled – it started life as bits and pieces, wood, and a discarded bicycle gear. I found it at Winterwoman Designs on Etsy. Jean, the artist, has some fabulous jewelry, home decor and kinetic sculpture, most made with recycled and upcycled bicycle parts, and all made with skill and artistry. Check out her shop, you’ll thank me! And such a find! it’s not new. It’s got history. It’s gorgeous. And yes, it’s not in perfect condition – there is tarnish – and a dent. This wouldn’t interfere with its function – and to me, doesn’t interfere with its beauty, either. 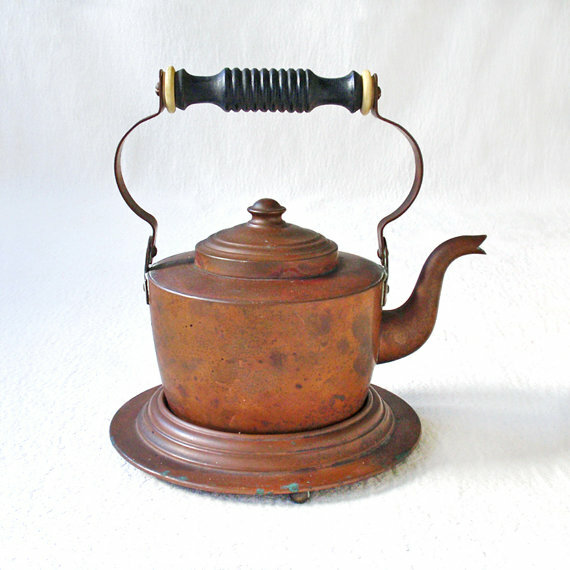 This happy little teapot has character. How cool if we can give it more life, and let it into ours. I found it over at Ratty and Catty over on Etsy – and by the way, with a name like that, I’m already inclined to love the place. But I don’t need to be inclined – they’ve got some yummy vintage treasures for the home and for you. And they ship worldwide, which not every vintage shop does. 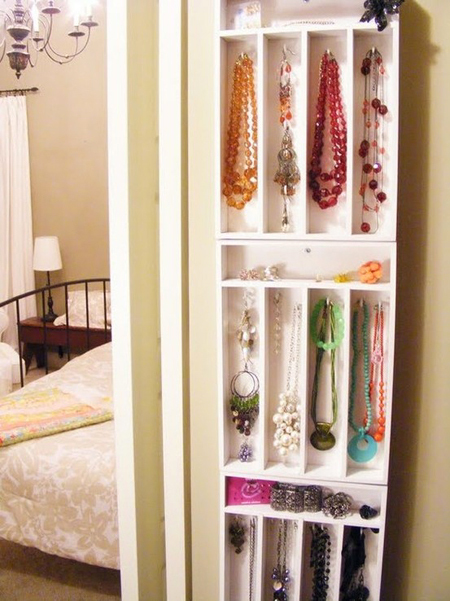 DIY jewelry storage – part three. I think. But the idea is clear. Cut cardboard to make dividers for a shallow drawer or tray or box. I’m in favor of the box – it’ll probably be free. Spray paint the whole thing white or some other color you love. I’d polyurethane it, after – to make sure it’s waterproof. Let it dry. Let it dry some more. Place your jewelry in the little compartments. Stick the whole thing in a drawer. Presto: organized storage. Practically free. Win! This isn’t a new idea – but it’s so beautifully illustrated here, I just wanted to share. 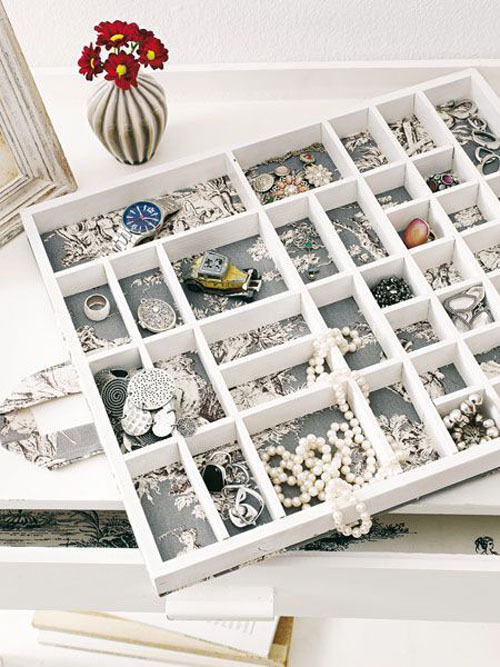 Super organized – and as a bonus, attractive do-it-yourself jewelry storage! 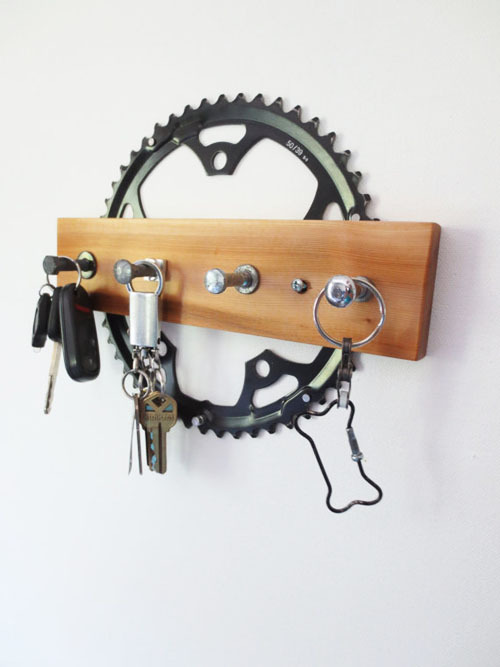 I love the way this makes a wall display – and at the same time lets you see your accessories. If you can’t find it, you can’t wear it! So: go to the dollar store – or find used trays at garage sales – bonus points for recycling and rethinking! Anyway – find one or three cutlery trays, or if you have a lot of jewelry, make more than one column. Show off your jewelry, get organized, and have a fabulous wall graphic all at the same time. P.S. Yes, I found this over on Pinterest. Love! Is that not a wonderful garment? It’s fun, it’s affordable, it’s not fussy or dressy – it’s just something you could toss on in the morning, go about your day, and know you look *good*. It’s available from Lillie Nora Dry Goods on Etsy and she has LOTS of great items, all upcycled I think, all fresh and fun and wearable. And woo hoo, they are not made for a girl who wears Size 2! They are not tiny, they are not huge – they are made to fit Real Women! I am in love. Go check out this shop, you are so going to thank me!